Our fabulous quiet 60 sqm apartment with private terrace. It comfortably fits 4, has high ceilings and is centrally located on a quiet green square with many shops and restaurants around and quick access to subway and tram or 20 minutes walk to the Old Town. If you are looking for true local experience in great, safe and lively neighborhood with quick and easy access to all popular sites then this is YOUR place! The apartment is modern and fully equipped with everything you need including dishwasher, washer/dryer, smart TV with internet access and NETFLIX subscription, hifi system with any mp3 player connection, espresso coffee maker, hairdryer and much more for either short or long stay for pleasure or business.. Bedroom has comfortable King size bed for two with quality mattress and wardrobe. From here you can enter your private spacious 10 sqm terrace with sitting/lounging area. Big living room/lounge area is combined with kitchen and has dining table for up to 4 people. It can be converted into second bedroom with its comfortable sofa pullout bed where two more can sleep. Kitchen is FULLY equipped with all necessary appliances - refrigerator, freezer, dishwasher, washer and dryer, glass ceramic cooktop, multifunction microwave oven, toaster, kettle and espresso maker for coffee lovers like us. There is also full set of utensils, glasses, knifes, pots, pans and rags. Fresh coffee, tea, salt, pepper, sugar, dishwasher tablets, detergents and more are provided. The bathroom is separated from the toilet and has walk in rain shower. Hair dryer, soap, shower gel, shampoo, towels, toilet paper - will all be ready for you. It is ideal for group of friends or family and can easily accommodate 4 people. 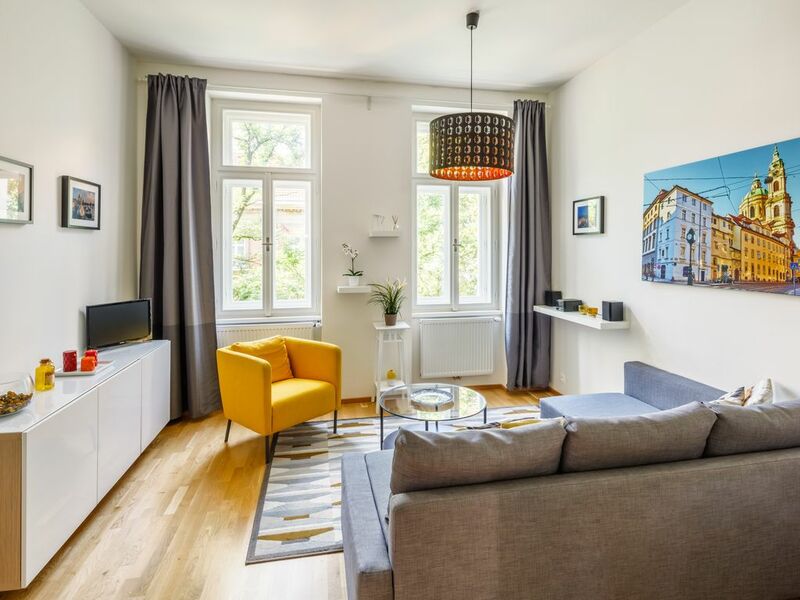 Our building "Residence Vinohrad" was completely redone in 2014 and is a jewel of Žižkovo square on the boundary of the flourishing ��ižkov and the beautiful Vinohrady district. Just 20 mins on foot to Old Town or minutes away by tram or metro to all touristic sights. We loved the apartment. Very comfortable, clean and in a great location amongst the locals. We found both metro and trams easy to locate and get us to our destinations. Wonderful restaurants and grocery nearby and all of the guide info that Robert wrote panned out to be right on target! We will visit again. Perfect location and lovely apartment! Our family (2 adults and 2 children) had a wonderful time in Prague. This apartment was in the perfect location to a bakery, restaurants, grocery and the metro/trams. The apartment was spotless, the check-in folder was fantastic for tips and the laminated instructions for the appliances was appreciated. We would stay here again. Thank you Rob and Pavel! Everything about the place was great, easy access, was great to have Robert and Pavel arrange for a driver to pick us up even though our flight didn't get in until almost 11pm. The neighborhood was great, the Uber driver picked us up right outside the apartment and only charged eight dollars to take us all the way to the castle. And all of their suggestions for places to eat were perfect. Definitely recommend! Beautiful,tasteful apartment,in a quiet and accessible location. Our hosts, Rob and Pavel, were very solicitous. We messed up with the taxi though. Our hosts ordered a taxi for the airport, and it seems we jumped into the wrong one LoL. This is a great one-bedroom apartment in a quiet area just a 10 minute tram ride to the city center. Lots of neighborhood restaurants and bars, and convenient supermarkets, etc. Rob and Pavel were excellent, accessible hosts, making sure everything was okay. We took advantage of their airport transportation service which included a 5:00 am pickup on the last day. Strongly recommended as a base for exploring Prague and the area.